Well, I have to say that 'beautifully twisted' is really a very apt description of this book. When I started reading AMSD I wasn't entirely sure what to expect and the beginning is a little odd - a wealthy, pregnant Victorian teenager locked away in an insane asylum. Definitely different. However, slowly but surely you come to know Grace and to feel her pain. I'm certain that historically the scenes in the asylum are probably pretty accurate, and as such, are even more horrific. Enter the doctor and the beginnings of a Victorian Criminal Minds' episode. Personally, as a CM fan, I found this fascinating, and the total disregard of the possibilities by the police made me wonder how we ever developed the sophisticated procedures we have now. It's easy to get attached to Grace, Nell and Lizzie and to feel a certain admiration for Doctor Thornhollow, how is trying so hard to learn more. 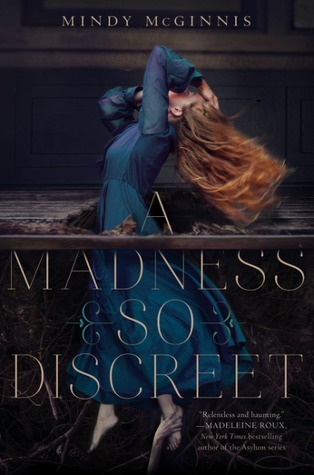 A Madness so Discreet was an illuminating look into the darker side of Victorian England and I found it engrossing and enjoyable. I'll be recommending this one. i hazard a guess that she is not crazy? I'm not telling ........ but you might be surprised. Great review. I loved this author’s other books, so I’m excited to read this one. Hopefully I’ll be picking it up today. You had me at "beautifully twisted", This book is fast on the road to becoming my next book to read.